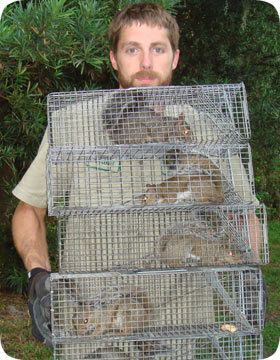 Below is a list of the types of services offered by nuisance wildlife control professionals. This line of work goes far beyond simple animal trapping. A true professional performs integrated pest management - we identify the root of the problem, and provide a complete solution to the critter problem. Most of the time, the animals that are causing a problem are causing damage of some sort. For example, the squirrels living in your attic are doing more than just making noise. They probably chewed part of your roof open in order to gain access, and then once inside, chewed on woodwork or wires. Or if you've got raccoons in your attic, they might have torn several large holes in the roof, or torn up all the ductwork inside. A very important part of the wildlife control profess involves identification of these damaged areas, and their repair. If you don't fix the hole that the raccoons have made, what's to keep future animals from entering the attic via that same hole? And who else is going to notice that the rats in the attic have chewed a hole in the A/C duct, and now you're losing a lot of AC air and energy into your attic? The wildlife operator should find such areas and patch them up. If some work, such as electrical work in the case of chewed wires, is beyond the scope of wildlife control repairs, the professional should at least inform the homeowner of the problem. Click here to read about How to find animal entry holes or the problems with tile roofs and animals. Prevention is, of course, the best medicine. No wildlife control job is complete without it. This is particularly true when wild animals have entered your home or attic. If you've got rats or squirrels or raccoons or any other critter in your attic, then your home has vulnerable areas - open vents? Loose soffits? Rotting fascia boards? It could be a whole number of areas. The only way to solve the problem permanently is to find these openings and to seal them shut permanently. In fact, if you've got rodents in your attic, it might be impossible to solve the problem without finding all of these openings and sealing them shut. All repairs should be of professional quality - all holes should be fixed with steel that future rodents can't chew through. Aside from repairs to openings in a house, other preventative measures might apply. For example, if you've got groundhogs or skunks living under a shed or deck, you might want a steel screened exclusion barrier installed around the perimeter of the architecture in order to keep critters permanently out. If you've got an elevated home or mobile home, you know that cats or other animals love to live under there and make a mess. Rats can crawl under a home and find openings by pipes and by the walls, and climb up into the walls and attic. An exclusion barrier will keep them out. There's a million little things - if you've got a lot of snakes, then perhaps some habitat modification is in order to make the property less attractive. If you've got raccoons stealing your ornamental goldfish, maybe you want netting installed around the pond or cover in the water for the goldfish to hide in. Whatever the wildlife problem, there's something that can be done to prevent a similar problem in the future. When animals live in an attic, they leave waste deposits behind. This can include urine, feces, fur, body oils, nesting material, food, and more. This can create an odor problem in your home, but worse, can be unsanitary or even a biohazard. Many animal droppings can cause human diseases such as Leptospirosis, and Salmonellosis. The Rickettsia virus, or even roundworm infection are potential risks. In addition droppings can grow mold, and this can lead to lung infections such as histoplasmosis. This is particularly true with large accumulations of droppings from birds or bats. Wild animals can also bring in parasites such as fleas, ticks, mites, and more. In addition, when an animal leaves its scent in an attic, it can actually attract other wildlife - big animals may try to break in if they smell the scent of mice or rats, and rodents often leave a pheromone scent behind that will call in new rodents. For all of these reasons, it's a good idea to have your attic cleaned. This could be as simple as the removal of waste and a decontamination spray, to a full insulation removal and replacement in the case of very heavy soilage. Ask your wildlife professional about attic cleanup if you've had animals living in the attic. For more information on attic cleanup, please see my full attic restoration page. You can also read about attic insulation replacement services, which are offered by several nuisance wildlife control operators. House Mice: Mice are small, and oftentimes people don't hear them, but at night when everything is quiet, you may hear the pitter-patter of tiny feet above your ceiling. The House Mouse loves to live in a ...house, and the walls and attic are safe places. At night, they may venture out into the kitchen in search of food, or go outside for food and water, then back into the house before dawn. Roof Rats: Rats are commensal with people - they live in urban areas, and often thrive on our food and shelter. They seek out the warmth and safety of houses and other buildings, and commonly take refuge in walls or attics. If you hear scratching and running in the middle of the night, it's probably rats. Squirrels: Squirrels are probably the most common animal in attics. These arboreal rodents usually live in trees, but many find that the attics of homes are drier, warmer, and safer than any tree - in particular, female squirrels with young will give birth to and raise the litter in an attic. If you hear the scratching and running noises in the daytime, particularly morning and early evening, it's probably squirrels. Opossums: These opportunistic marsupials often live in human structures, under sheds and houses, and they also often live in attics. Just as with the other animals, a female with young is most likely to choose to live in the attic. Possums, equipped with their opposable thumbs, are great climbers, and can easily get onto the roof to their entry point. Possums do not live in attics as frequently as these other animals, but it does happen from time to time. Other Animals: Stray cats will sometimes live in an attic as well. Bats are very common, but people don't often notice them until the colony becomes very large and vocal, or until the odor becomes overwhelming. Birds also live in attics from time to time. Whatever the animal is, a wildlife professional can easily determine the species - if it's not spotted outright, there's plenty of evidence left behind! - Trails, footprints, droppings, chewmarks, and more. For more information on the subject, read my noises in the attic at night guide. Many wildlife control operators really specialize in bat control and bird control. This is specialty work, and often far more complicate than other types of wildlife removal projects. Oftentimes, this involves work for large commercial or industrial buildings. For example, a large group of pigeons could infest a shopping mall or warehouse, or a large colony of bats could live in the roof of a ten-story condo or hotel. Some bat removal and bird control projects can be very large and involved. True, there are plenty of smaller, residential cases. Bats commonly live in the attics of homes. However, many of these projects can be very involved as well. Oftentimes bat or bird removal means accessing very difficult architecture, as these are flying animals. Pigeons can be very persistent, and bats can squeeze through gaps as small as 3/8 of an inch. If you have a bird or bat problem that you need solved, it's best to call a wildlife professional with experience in the field. More guides I wrote here: bats in the chimney - how to catch a bat - bat trapping - bat in the house - bat prevention. Many homes and businesses take great care maintaining their property and landscaping, and sometimes wildlife can damage it. A common culprit is moles - they dig all through the yard, and can create many tunnels and dirt mounds. Raccoons will often peel back fresh sod in search of grubs. Armadillos and skunks will dig the dirt for worms and grubs. Deer will eat bushes and other ornamental plants. Geese will litter a property with droppings. The professionals listed here can take care of these problems. From mole trapping and control, to wildlife removal, deer discouragement and Canada Goose management programs, wildlife operators can protect your yard and property. Several wildlife scenarios are emergency situations, or at least are perceived as such by the homeowner. Most commonly, the scenario is an animal inside a home. A raccoon could enter through a pet door and get stuck inside, or a squirrel could fall down a chimney and run loose in the house. Sometimes a snake will enter the house through a small opening, and the homeowner will see it in the kitchen and freak out. Or perhaps a bat will get stuck inside a house and fly around in circles. Whatever the case, if you've got a wildlife emergency that requires immediate assistance, there's a good chance that a competent wildlife operator will be able to help save the day. Availability is the big issue, of course - there's a chance that your emergency will happen at 3:00 AM or that the company you call will be busy working inside an attic on the other side of town. However, most wildlife removal companies provide assistance in emergency situations, so stay calm and pick up the phone. While we mostly remove live animals, sometimes we remove dead animal carcasses. The most common type of dead animal removal is that of a dead rat or squirrel in an attic or wall. If you've got animals living in your attic and you don't take care of it, one of the potential consequences is that the animal will die in the house. A dead rodent is even more likely if someone has employed the ill-advised tactic of using a rodenticide or any other type of poison control. Once the animal dies, it starts to decompose. The odor starts about three days after death. The strength of the odor depends on several factors - the size of the animal, the location (down a wall is worse than in a well-ventilated attic), the temperature, the humidity, and so on. The odor will last for a long time. If the animal is larger, it could be well over a month. In some cases, the odor has been so bad that the homeowner has elected to move out of the house rather than live with the stench. Don't let it come to that: hire a wildlife specialist to remove the dead animal. If it's in the attic or down a wall, a competent professional will be able to find it, remove it, and decontaminate the area. If you've simply got a case of a dead carcass outside somewhere, we can also come and remove that as well, and dispose of it in the proper manner.